This product is designed to make sure if you have to drive, that you are safe to do so. Particularly in situations the morning after when you feel fine, but have no way of telling if your body has significantly processed your alcohol intake from the night before. On average it takes around one hour for each unit of alcohol to pass through the body - although this can vary according to a number of factors. We hope this gives you many years of use and helps you remain a safe driver. 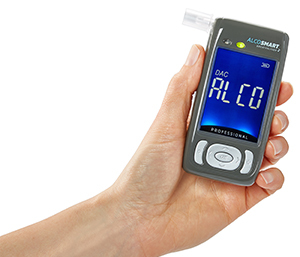 This products calculates the level of alcohol in your blood by analysing your breath when you breath into the unit using a semi-conductor gas sensor. When the user exhales their breath onto this gas sensor, any ethanol present in their breath is oxidized to acetic acid and water. The electrical current produced by this reaction is measured by a microprocessor, and displayed as an approximation of overall blood alcohol content (BAC) by your AlcoSmart Professional. Blood alcohol content (BAC), also called blood alcohol concentration, blood ethanol concentration, or blood alcohol level is most commonly used as a metric of alcohol intoxication for medical purposes. Blood Alcohol Content is the legal name for BAC but Blood Alcohol Concentration is sometimes used for simpler description. Blood alcohol content is usually expressed as a percentage of alcohol (generally in the sense of ethanol) in the blood in units of mass of alcohol per volume of blood or mass of alcohol per mass of blood, depending on the country. For instance, in England a BAC of 0.1 (0.1% or one tenth of one percent) means that there are 0.10 g of alcohol for every decilitre (dL) of blood. 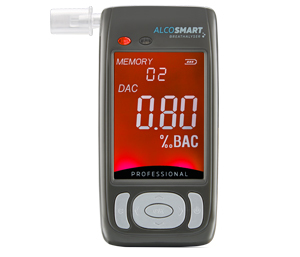 The AlcoSmart Professional is calibrated for the drink drive limit of the country it is sold in. If you give a reading above that level the screen will flash Red. However to allow for a margin of error in the accuracy of the results we suggest a Caution Level, and that you should only consider driving if your reading is in the Safe Level. Your alcohol level may vary depending on your body type and other physical conditions. Under no circumstance should this product be used to judge whether one can drive a car, operate machinery or conduct other potentially dangerous activities. Neither the manufacturer nor the retailer accept any liability for illegal behaviour such as drunk driving, irrespective of whether the product is used or not. Under no circumstances should you drink and drive. The last 6 breath samples are recorded for later reference. The AlcoSmart has an inbuilt thermometer and will give you a room temperature reading when in standby Clock Mode. 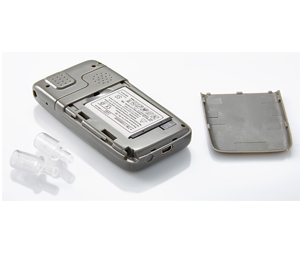 This feature also allows the unit to check it is giving you an accurate reading. Please note that as the temperature sensor is built into the base of the unit the temperature reading will often increase due to the warmth of your hand when handling the unit. Also if you have the unit on charge the temperature reading will also be higher, this is because the battery is warming up and in doing so is also warming the circuitry inside. The AlcoSmart takes this into consideration when calculating your reading.